Undeniably one of my favorite aspects of traveling is the opportunity to meet some amazing people. People who provide endless hours of entertainment, add a little to your understanding of the world and yourself, and fundamentally challenge what you thought might be possible. The three Norwegians we met at our place in Beijing, getting ready to embark on a four-month motorcycle journey from there back to Norway, fulfilled all of the above. 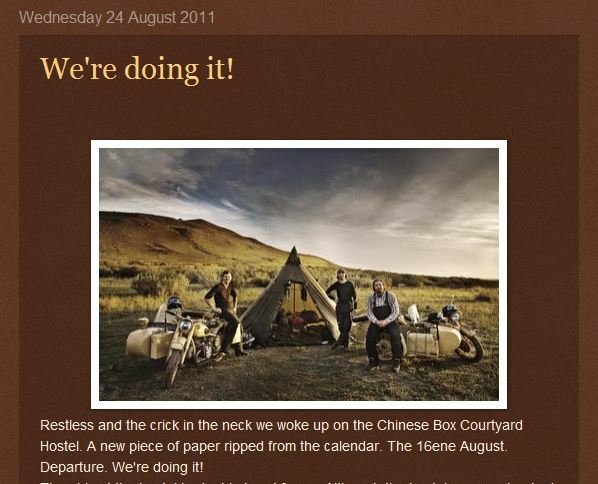 An engineer, a nurse, and a photographer on two motorcycles with two sidecars plan to ride half way across the globe. They’re calling their adventure from “From East to West on the Iron Horse.” You can follow along at jernhesten.blogspot.com or on Facebook (click here). For those of our friends who don’t speak Norwegian, Google Translate does the trick. Just cut and paste the URL right into Google Translate and you can read the entire blog at one time in English. A snipe of the blog: "From East to West on the Iron Horse." They’re planning to travel through some areas that most of us will never see (Kazakhstan, the Gobi desert). Their goal: “meet people and ask for opinions, thoughts and relationships with the West, our society and values.” If these guys are half as captivating on this trip as they were at our hostel, this adventure will certainly be a thrill to watch. Oh and the top-notch photography is pretty easy on the eyes. The good news is that by the end of this trip, Nellu and I will be quite adept at bargaining. The bad news is…we’re not there yet. We went to a few of Beijing’s famous marketplaces while we in town, namely Pearl Market and Silk Market, to get a few items we had yet to pick up for our trip. Interestingly, the markets themselves were more like a department stores, jam-packed with booths each hawking their wares, than open-air flea markets. The salespeople call out to you (and even grab you, touch you and keep you from leaving) as you pass through ticking off some of the brands they think will interest you. Apparently I looked like I was in the market for Gucci, Prada, or Louis Vuitton. First up, the bag. Nellu is very particular about his bag . He wanted an airplane bag that was big enough to fit his camera, Jimmy McMillan doll, and a few other necessities for our day treks. We hadn’t found anything quite the right size or style in New York. 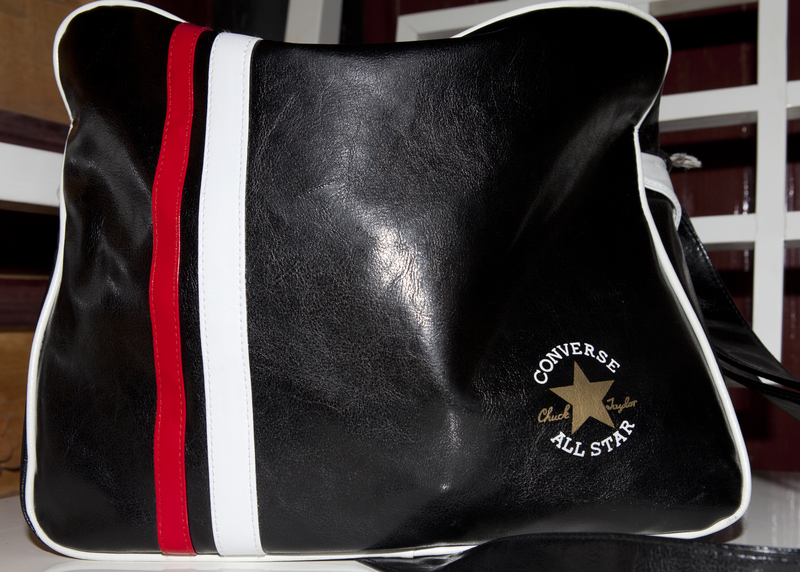 But in the bag heaven of the Silk Market, he found a “Converse” vinyl bag that would surely do the trick. And it’s allegedly fireproof, or at least that’s what the saleswoman was implying by attempting to light it on fire with a lighter (several times). Nellu asked how much. She opened with CNY1200 or close to $190. Whaaat!? This bag is a lovely bag but clearly not worth with nearly $200. She knew it but could probably tell that Nellu liked it a lot and thought that opening with such an outrageous bid would force us to go much higher than we wanted. She was right. After going back and forth, Nellu got her down to about CNY150 or about $23 dollars. Done. Is $23 a bad price to pay for a bag that you use everyday? Not at all. But could we have done better? Of course. And I went on to prove it to Nellu about two minutes later, when we walked by the exact same bag at another stand. (To be honest, this one might not have been fireproof. This salesman did not try to set it on fire like the last had.) I was able to get it for about half the price. Still after teasing Nellu for his bag bargaining, I went on to make an equally poor deal. I paid CNY20 or about $3 for a plastic, metallic painted ring with “real crystals” that I should have gotten for less than a dollar. My mistake: opening too high. I just didn’t really know how to start at cents on the dollar. 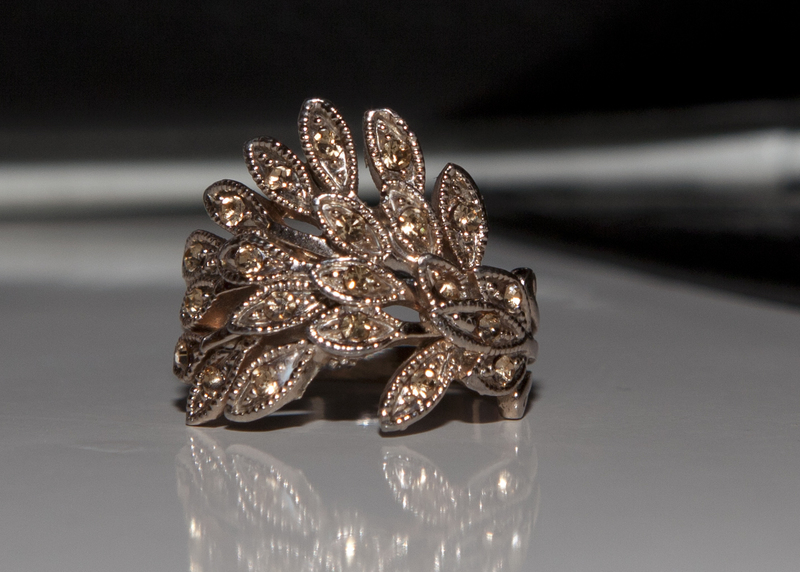 My new wedding band, at least for now, with "real crystals!" Admittedly, I’ve never been good at bargaining. When we went to Bali for our honeymoon, I paid $20 for a sarong on the beach. Why so much? I liked it, it was about what I would have paid in New York, and I didn’t want to take advantage of the woman selling it. But generally, I think the issue is more that I have a price that I will pay in my head. It’s usually cheaper than what I would expect to get for it at home. Add in a the thrill of the chase and the necessity to do math in my head quickly and you got me fogged up long enough to get me to overpay. But we’ll get better at bargaining. Oh will we get better, which should help when we go back to work and need to negotiate our new salaries. I really don’t mean to get in other people’s photos. In fact, when I do get in the way, I am actually trying to get out of the way because Beijing is the busiest city we’ve seen so far. 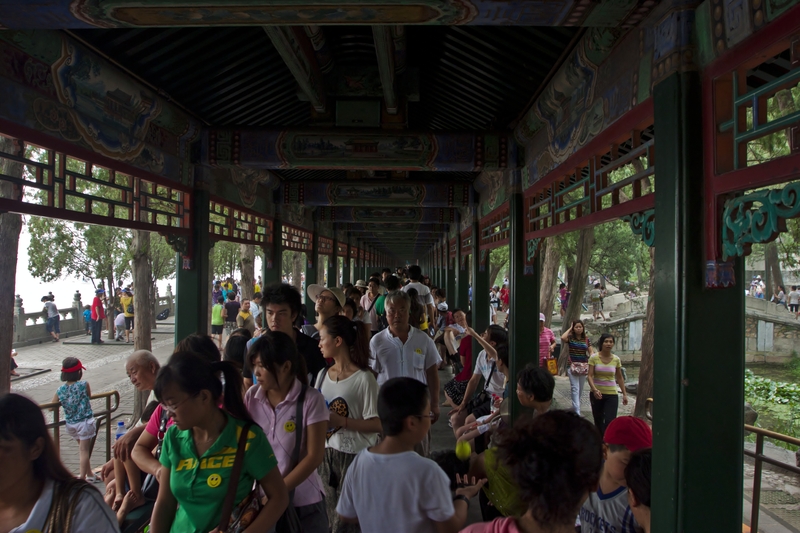 Yes, we are going to see the major tourist sites – the Forbidden Palace, the Temple of Heaven, the Summer Palace, the Great Wall – but we’ve done some touristy things in other countries and have never encountered this many people. And the sites themselves are huge. 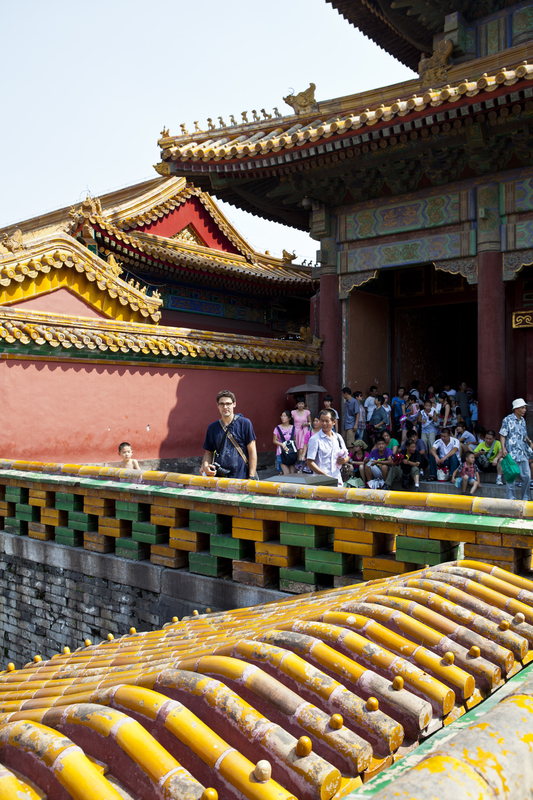 It took us nearly all day to do the Forbidden Palace and yesterday we walked around the entire Summer Palace. 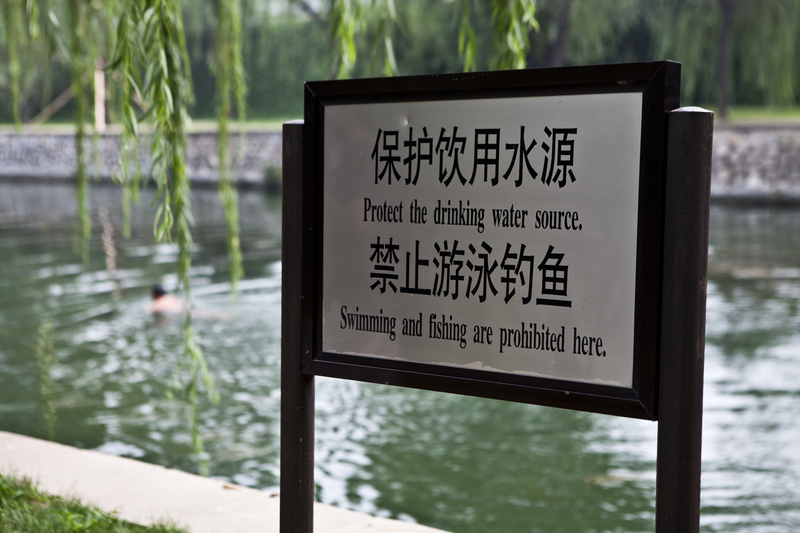 (And by Summer Palace, they really mean huge park with a lake and a couple of gorgeous buildings.) I need to do some more research but in my imagination, it’s like walking around the perimeter of Central Park. I never fully appreciated how wimpy my feet were until we got to Beijing. 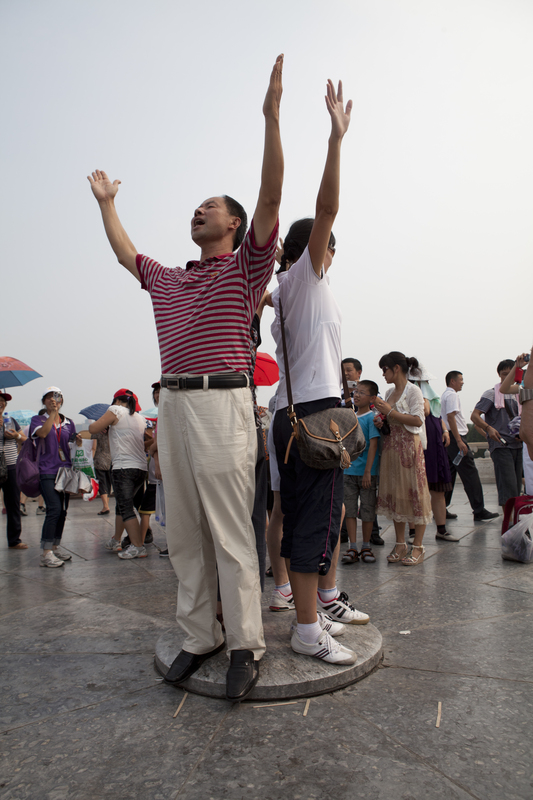 People watching is just as interesting as taking in the sights. Don’t swim, unless you feel like it. Oh, and by the way, many of kids here are already learning English. 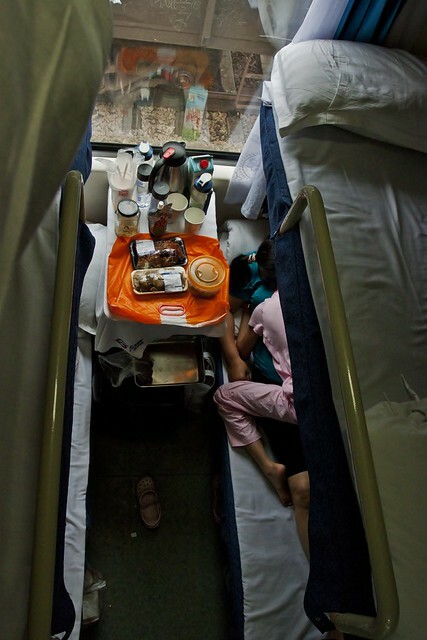 On the train from Beijing to Hong Kong, we slept on the top bunks of a six bunk hard sleeper compartment (not bad at all). Below us were two girls around eight and ten years old. They must have heard us speaking English because at one point they started ticking off all the English words they knew – water, mother, dad, school, kindergarten, pencil box – between flirting with and giggling at Nellu of course. At one point, the younger of the two looked up at me and said, “American.” It was quite impressive.